(CNN) -- Threats by al Qaeda in the Arabian Peninsula against targets in Yemen prompted the closure of the U.S. and British embassies there Sunday, officials said. "There are indications that al Qaeda is planning to carry out an attack against a target inside of Sanaa, possibly our embassy," John Brennan, the assistant to the president for homeland security and counterterrorism, said on CNN's "State of the Union" on Sunday. "And what we do is to take every measure possible to ensure the safety of our diplomats and citizens abroad, so the decision was made to close the embassy." Another senior administration official told CNN late Sunday that the closing of the U.S. Embassy was because of a specific, credible and ongoing threat. No additional details were provided. The British Foreign Office told CNN its embassy also closed because of security concerns. A spokeswoman said a decision would be made later Sunday on whether it would reopen on Monday. U.S. State Department spokesman Fred Lash would not elaborate on any specific security threats, and said he did not know how long the embassy would remain closed. The embassy on December 31 alerted Americans in Yemen to remain on alert for the possibility of terrorist violence. On Christmas Day, a Nigerian man allegedly attempted to detonate an explosive device on board a Northwest Airlines flight from Amsterdam, Netherlands, to Detroit, Michigan. On Saturday, President Obama linked the suspect, 23-year-old Umar Farouk AbdulMutallab, to an al Qaeda affiliate based in Yemen. Shortly after the incident, Yemen-based al Qaeda in the Arabian Peninsula claimed responsibility for the bombing attempt. In a Sunday interview on the BBC's "The Andrew Marr Show," British Prime Minister Gordon Brown said besides increased security measures, "We've got to also get back to the source of this, which is Yemen, Somalia, Pakistan, and we've got to recognize that we've got a group of young people who have been radicalized as a result of teaching by extremist clerics, and we've got to recognize that we're fighting a battle for hearts and minds here as much as everything else." He said Britain will work with American authorities to support the Yemeni government in its counterterrorism efforts. Al Qaeda in the Arabian Peninsula said the attempted attack on the airliner was in retaliation for airstrikes against it on December 17 and 24. 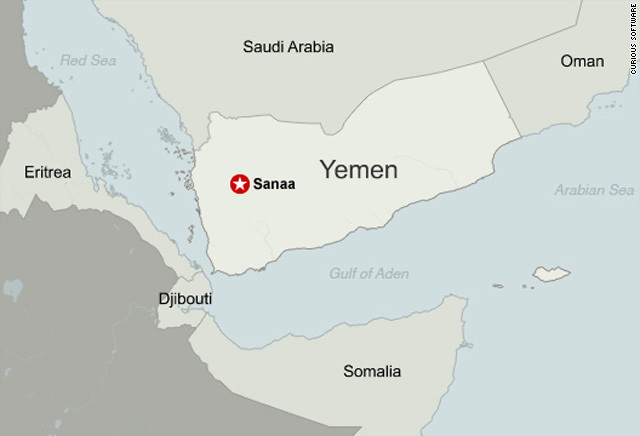 One of those attacks targeted four al Qaeda operatives believed to have been planning an imminent attack in Yemen against the United States or Saudi Arabian embassies, or both, a senior U.S. military official told CNN on Sunday. On Saturday, Gen. David Petraeus, head of the U.S. Central Command, met with Yemeni President Ali Abdullah Saleh in Yemen, a senior U.S. government official told CNN. During his meeting with Petraeus, Saleh expressed his appreciation for U.S. help in combating extremists, offered more support for U.S. counterterrorism strikes, and said he would continue providing assistance for the U.S. investigation into the attempted bombing, the official said. A man claiming to be a member of al Qaeda addresses a crowd in Yemen's southern province in December. Obama said that AbdulMutallab had recently traveled to Yemen and that "it appears that he joined an affiliate of al Qaeda." Al Qaeda in the Arabian Peninsula apparently trained AbdulMutallab, equipped him with explosives, and directed him to attack the plane, the president said in his weekly radio address. We are very concerned about al Qaeda's continued growth there, but they're not just focused on Yemen. "This is not the first time this group has targeted us," Obama noted. Recently, he said, "they have bombed Yemeni government facilities and Western hotels, restaurants and embassies -- including our embassy in 2008."